I will be adding more information about Horseback Riding in Southern Ontario, meanwhile, here is information about Stables in the London, St Thomas and surrounding area. You can ride the trails through the lovely southern Ontario countryside with an experienced guide. The Dude Ranch is well known in this area and is a well-established family run business - being owned and operated for over 40 years by the Steele family. 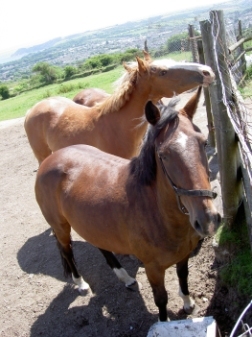 Several of our children have had their first riding experiences here, and they have always wanted to go back for more! If you are looking for Horse Riding Lessons in the St Thomas area, you can contact the Fehr family at Sunnylee Stables on Yarmouth Centre Road, just north of Highway 3. For more information call 519-633-7082, Kimberley or Henry will be able to give you all the information. 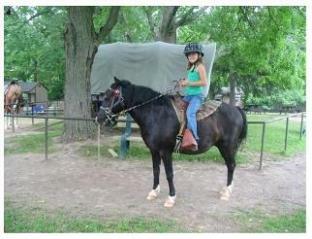 Check out their site for rates for lessons, trail riding, family activities, Summer Camps and more! It has been years since I was here, but one of my grand-daughters recently celebrated her 5th birthday here - they had a party with hot-dogs, cake & ice-cream, pony rides, a Hay Wagon ride, and a look at the little mini farm. What a wonderful day those children had - check out their website for full information. If you are looking for accommodation close to the Circle R Ranch, check out Oma's Loft which can sleep 4 people and is comfortable and convenient for those wishing to ride. Circle Square Ranch, Brantford, Ontario Circle Square Ranch offers exciting summer camps for children and teens aged 5-16. Activities such as horse-back riding, wall climbing, zip line and archery are just a few of the great things they have to offer. Circle Square Ranch is a Christian non-denominational children's summer camp and retreat centre. Conestogo River Horseback Adventures Located on Northfield Drive East in Waterloo, Ontario, this facility has so much for the horse enthusiast - trail riding, sleigh and wagon rides, and summer Camp for children! Whinny Acres near Princeville, Ontario, is a horse-lover's paradise! Trail rides are offered, ranging from one hour, to one week - there is something for everyone, including Over-night, Week-end and three-day camps. You can contact them from their website, or at 519-924-1478. Whinny Acres also has Bed & Breakfast accommodation - you can check this out on their website. For an all-round horse-back riding experience Rawhide Adventures is one of the most exciting we have heard about! Located near Shelbourne, Ontario, this would be a wonderful place for a week-end get-away. There are various packages from which to choose, including meals and accommodation if required. Located to the north of Kitchener, Shakespeare Stables can be contacted at 519-625-8459. Belmirage Stables, Wyoming on London Line, Wyoming, Ontario - horseback riding and much more! Ancaster Riding School, Ancaster This is a new edition to Day Break Equine Services, providing starter lessons for new riders, and also day camps during holidays and summer months. Do you have a Horse-Crazy daughter in your family? 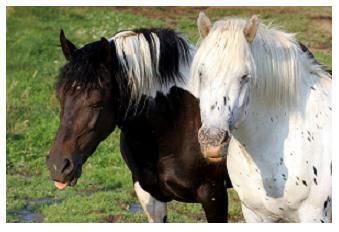 Here is a great website about Horses and Horse back Riding that all Horse lovers will enjoy! Have A Favourite Horseback Riding Stable? Horseback riding has always been a popular pastime - would you like to share with us YOUR favourite Horse riding stable? Where are the best horses to ride in your area - do you have an exciting story to tell? Our readers would love to hear about it - send us your pictures too, we would love to feature your story on our site! Do you have a picture of you on horse-back to add? Great! Click the button and find it on your computer. Then select it. This is one of the most amazing videos about the Horse that I have ever seen - I hope you enjoy "Lorenzo National Horse Show"